When a man from Saudi Arabia kept having nosebleeds, few people could have predicted the cause. The 22-year-old, who suffered nose bleed at least one a month over three years, had a tooth growing in his nose, a report reveals. 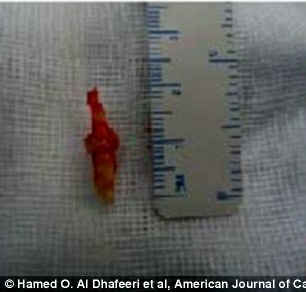 Doctors found a white bony mass measuring half an inch (1cm) long growing in his nasal cavity. A dentist explained that extra teeth are not that unusual, but they rarely grow inside the nose. Up to 3.9 per cent of people have more teeth that usual and they can erupt in unexpected places, according to previous studies. Around a third of mesiodens (a common type of extra tooth found near the incisors) develop upside down and can travel towards the nose. Extra teeth can appear in the palette as a normal looking extra tooth, or can grow into the nasal cavity in rare cases. Symptoms of such a problem include a blocked nose, headaches, nose bleeds, foul-smelling mucus and even external deformities of the nose. Upon seeking advice from dentists, it was confirmed the mass was in fact an extra tooth. It was this that was responsible for the bleeding, they added. The nosebleeds usually occurred after ‘minor nasal trauma’ – or rubbing of the nose – and the patient also frequently had tonsillitis. According to the study,’ an intranasal supernumerary tooth’ was causing friction in an area of the nasal septum, resulting in bleeding. The discovery of the tooth was particularly surprising because the man had a complete and well-aligned set of normal teeth in his mouth, Live Science reported. To solve the problem, doctors from the King Fahd Military Medical Complex, in Dhahran, put the man under general anaesthetic before pulling out the rogue tooth. 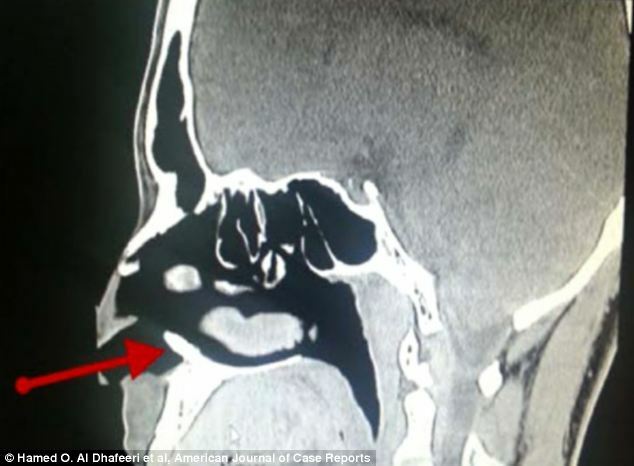 Three months later, the patient’s nose had healed and his nosebleeds had ceased, according to the report published in the American Journal of Case Reports. Commenting on the case, dentist Dr John Hellstein, who is a professor of oral pathology at the University of Iowa, told LiveScience that while extra teeth are not that unusual, they rarely grow inside the nose. The dentist also remarked that it is surprising that the tooth went undetected for so long. It is thought that the man may have had a mesioden – a common type of extra tooth found near the incisors. Dr Hellstein explained that around a third of them develop upside down and can travel towards the nose. Previous studies have found that up to 3.9 per cent of people have more teeth that usual and they can erupt in unexpected places. Dr Hellstein said that he sees several cases every year, but that a tooth erupting in through the nasal floor is ‘unusual’.